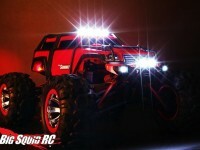 monster jam replicas « Big Squid RC – RC Car and Truck News, Reviews, Videos, and More! You are browsing the "monster jam replicas" tag archive. Recently we posted the information about the new Traxxas Son-uva Digger Monster Jam Replica Truck. Well Traxxas has now followed up their press release with a video of the truck in action for your viewing enjoyment. Enjoy the embedded video below..Looking for more news from Traxxas? Click Here for our Traxxas news. At times the Traxxas Try Me Track at RCX 2011 seemed more like the Traxxas Demo Derby Pit. It’s a good thing the old Stampede chassis is tough enough to handle it.